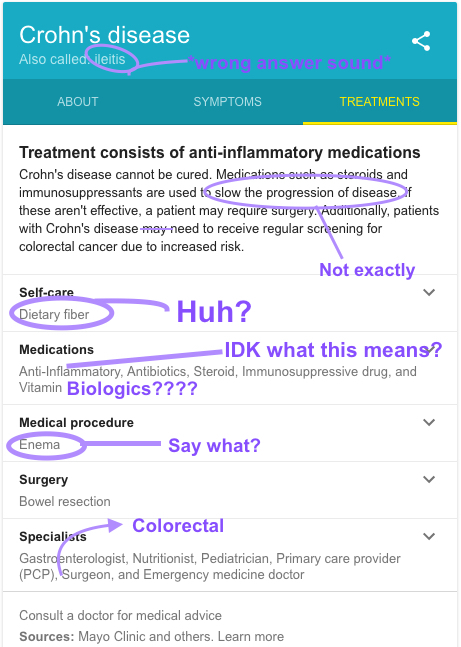 This is what Dr Google gave me when I searched for “Crohn’s disease.” I made a few edits because I don’t quite think this information is up-to-date. If I were contracted to edit this, and receiving payment for my time, I would send it back with a complete rewrite and a suggestion that the author was not qualified to write on the topic. This is what searching Google for Crohn’s disease gives you. It doesn’t exactly inspire confidence, does it? This entry was posted in Advocacy, Amber Says and tagged Crohn's disease, dr google, inaccurate information on August 8, 2016 by Amber.